Posted by claireblang in 2008 Season, Drivers, Items of Interest, Listeners, NASCAR, Transcripts. Good morning from Charlotte! All the way home last night we debated sports in which the same team/person wins all the time and how fans of various sports react. That will be the topic today. I have had emails on how frustrated Kurt Busch was —ready to pull his car off the track – and asking for permission to do so……Penske management saying no. I have had emails from Johnson fans and fans of other drivers regarding the chase and statistically the chances that anyone can catch him. I got this from a listener: Larry maintains that most race fans who are “up on the wheel” today about their driver’s chances in the chase do not understand that “IF” their driver were to win all the remaining races, why wouldn’t they be in first place and win the championship. Potential best avg if….IF any of the drivers were to win all of the remaining races…however unlikely…. Obviously, at the rate we are going, says Larry, a “sub-avg-5” will not guarantee a championship….but something well below a sub-5 avg….maybe. Ryan Newman is driving a truck this weekend at Atlanta. I wrote the story from a source in a blog a couple of days ago and now it’s official. 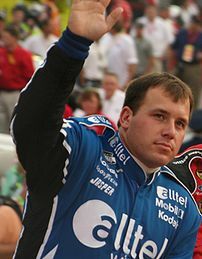 Ryan Newman, known as “The Rocket Man,” slides in behind the wheel of the No. 2 Kevin Harvick Inc. (KHI) American Commercial Lines (ACL) Chevrolet for the first time at Atlanta Motor Speedway (AMS). Newman has never driven in the Truck Series, but has an honorable pole record in the NASCAR Sprint Cup Series with seven poles in thirteen Sprint Cup starts at AMS. Newman is currently tied for the all-time pole record in the Sprint Cup Series. Newman has two starts in the Nationwide Series and has one pole and a second place start in that division. Q: THIS IS YOUR FIRST TRUCK RACE. WHAT ARE YOUR EXPECTATIONS? Q: WHY DID YOU CHOOSE TO RUN A TRUCK SERIES RACE FOR KHI? Q: WHAT ARE THE SIMILARITIES BETWEEN A TRUCK AND A SPRINT CUP CAR? Q: WHAT IS THE KEY TO RUNNING A FAST LAP AROUND ATLANTA? CHASSIS HISTORY: The No. 2 ACL team will bring chassis number 014 to Atlanta Motor Speedway. The chassis took to the track earlier this season at AMS where the No. 2 team earned their first top-10 finish of 2008 with a sixth-place finish. Chassis 014 also competed at Bristol (Va.) Motor Speedway and was rebuilt after the event due to a crash. The team refers to this chassis as “Old Faithful” due to the fact that this is the oldest downforce truck the No. 2 team has in their stable of chassis. “Old Faithful” also has a consistent record of being solid throughout a race and coming on strong at the finish. Thanks all….back to work in the studio getting today’s show ready. Thanks for checking out the blog! I have an idea for chase-race-qualifying rain-outs. Instead of reverting to the point standings, why not start the first 12 cars lotto style. On the next rain-out, whoever got picked first on the previous race, starts twelve on the next. That’ll add a little twist to things.